Start out going North on Airport exit ramp. Merge onto GW Parkway North. Take exit on the left toward US-50 W/Memorial Bridge/ Arlington Cemetery. Keep RIGHT at the fork in the ramp, merge onto Arlington Blvd/ US-50 W.
Take the ramp toward ROSSLYN; turn SLIGHT RIGHT onto N LYNN St.
N LYNN ST becomes FRANCIS SCOTT KEY BRIDGE; turn RIGHT onto M ST NW. Turn left onto 33rd St. Turn slight left onto MD-187 W/ Old Georgetown Rd. Turn left onto Woodmont Ave. Turn left onto North Ln. End at 3 Bethesda Metro Ctr., Bethesda, MD 20814. Follow signs for Airport exit to Dulles Airport Access Road. Take the Dulles Airport Access Road for 12.5 miles, merge onto VA-267, toward I-495 North to Maryland. Bear right to take Exit 18 for I-495 North to Bethesda. Turn left onto Wilson Ln/ MD-188. Turn right onto MD-187/ Old Georgetown Rd. 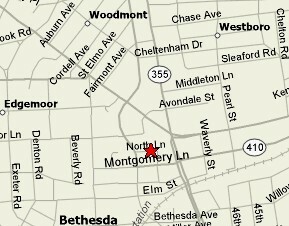 Turn right onto Woodmont Ave.
End at 3 Bethesda Metro Ctr., Bethesda MD 20814. Follow signs for Airport exit to I-195 West. Merge onto MD-295 S via Exit 2B toward Washington. Merge onto MD-100 W toward Ellicott City. Merge onto I-95 S via Exit 5A-B toward Washington. Merge onto Capital Beltway/I-495 W via Exit 27 toward Silver Spring. Take the MD-185 S/ Connecticut Ave Exit toward Chevy Chase. 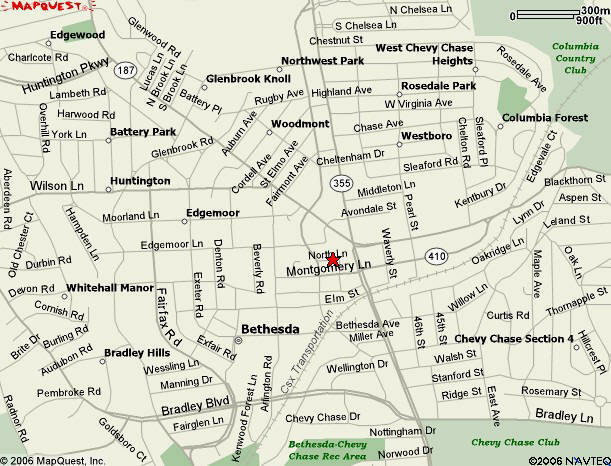 Turn right onto MD-410 W/ East-West Hwy. MD-410/ East-West Hwy becomes MD 187 W/ Old Georgetown Rd.